All forms of energy will be needed to power economic progress. The use of cleaner-burning natural gas, especially in power generation, can help to build a sustainable energy system. Lange gas processing plant, Norway. As technology advances, so does our ability to unlock the world’s natural gas resources. Natural gas is affordable and abundant. The International Energy Agency says that there are enough recoverable natural gas resources to last around 230 years at current consumption levels. 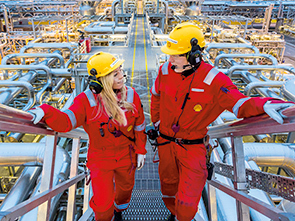 Shell produces around as much natural gas as oil and, by 2030, we expect global demand for natural gas to increase by 60% from its 2010 level. Countries with large domestic natural gas resources have the potential to continue to boost economic growth, while minimising the environmental impact, by using gas rather than coal in power generation. A natural gas-fired power plant produces around half the carbon dioxide (CO2) emissions of a coal-fired plant. It significantly reduces smog-causing pollutants and costs less than half as much to build. Displacing coal with natural gas in power plants is the fastest and most affordable route for many countries to achieve their CO2 reduction targets. Natural gas is also an ideal flexible back-up partner for renewable energy to maintain a steady flow of electricity. The development of the Corrib gas field (Shell interest 45%), off Ireland’s Atlantic coast, is important for the country’s energy security. Two-thirds of its electricity is generated using natural gas and 95% of the natural gas is imported. Once the Corrib field starts production around 2015, it has the potential to provide up to 60% of Ireland’s gas needs. The project provided jobs for 1,400 construction employees in 2013, and the final section of the onshore gas pipeline has been installed. Construction of a 4.9 km tunnel under Sruwaddacon Bay, a special conservation area, is progressing. The Erris peninsula, where the project is located, is a region where little significant industrial or commercial employment previously existed. The Corrib gas terminal will sustain around 175 full-time jobs during the 20-year lifespan of the gas field. The Shell-operated Ormen Lange field (Shell interest 17%) is 120 km from the west coast of Norway. The gas is transported to an onshore processing plant in Norway and is exported through a 1,200 km pipeline to Easington on the north-east coast of England. Ormen Lange supplies around 20% of the UK’s gas needs. As well as providing substantial income through state ownership and taxes, Ormen Lange has contributed to the Norwegian economy with jobs, knowledge transfer and skills building. In its first five years of operation, around 30% of the operating costs were spent in the local area, close to the Ormen Lange onshore facility at Nyhamna, according to analysis by the Møreforskning research institute. Large oil and gas companies recruit from the region, while local industry has grown to deliver services to Ormen Lange. In 2013, Nederlandse Aardolie Maatschappij (NAM, Shell interest 50%) started to use nitrogen injection for enhanced gas recovery at De Wijk, one of the oldest onshore natural gas fields in the Netherlands. The field has been in production for more than 60 years and is classified as a “small field” by the Dutch government. This is the first time that the technology has been used to significantly increase the production life of an ageing onshore gas field. Nitrogen injection is expected to extend the project’s life by around 15 years, and ultimate gas recovery could rise from 73% to as much as 83%. When injected, the nitrogen keeps pressure in the field high enough for wells to continue to produce gas, by pushing the remaining natural gas to production wells underground. The nitrogen gas is supplied from a purpose-built air separation unit. This required careful integration with the existing field infrastructure to reduce the impact of our operations on neighbours and the environment. Wind remains an important part of the current and future global energy mix. Shell has been developing wind power for more than a decade and is involved in 10 wind projects in North America and Europe. Our share of the energy capacity from these projects is around 500 megawatts. Most of this energy comes from around 720 turbines at eight wind projects in the USA.